This portrait depicts Luther Burbank, the horticulturist who is famous for growing unusual vegetable and fruit hybrids. In this portrait Burbank is shown as a hybrid with half as man and the other half as tree. It shows Burbank was holding a plant without root which is obvious one of his hybrid and himself was planted. His lower lets are displayed as tree trunks and the roots are fed by his own copse. 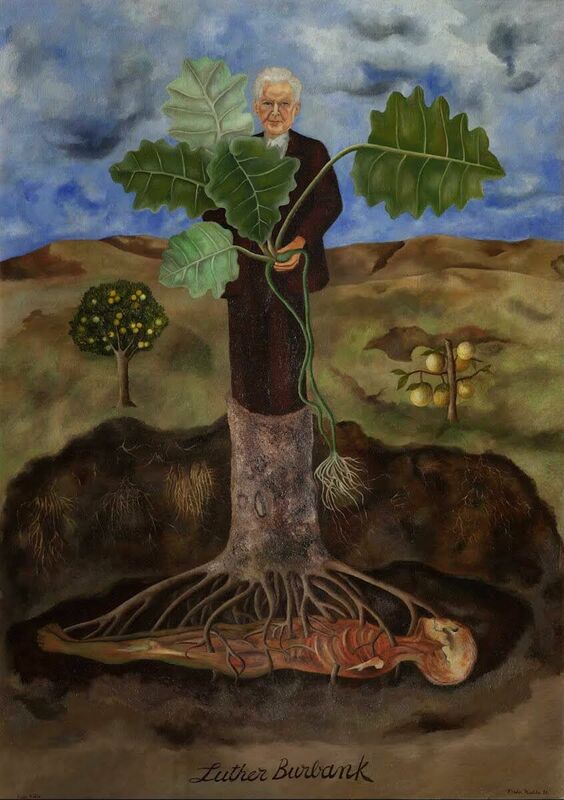 This painting is the first painting shows Frida's favorite theme: "the fertilization of life by death". Burbank was buried under a tree of his California home after he died in 1926 and i's just a metaphor of it. In this portrait for the first time Frida turned away from the straightforward depiction of the external subject. She was in contact with Surrealism while she was staying in San Francisco and might be influenced by the style. Another speculation is that this painting's style came straight from her Mexican background. In Mexican culture they believe human beings would transfer into plants and animals and this is a common topic in Mexican art.